Shropshire start their Unicorns Trophy campaign with a home game against Cumberland at Shrewsbury on Sunday. The 2010 winners, who made the most recent of their five finals in 2013, had their qualifying campaign wrecked by the weather last summer. It included a trip to face Cumberland at Cockermouth, which was washed out over just four overs. But Shropshire are hopeful of better times ahead after being disrupted by two changes of captaincy last summer. Cumberland have won only two of the 10 previous meetings between the two counties in the competition over the last 32 years. "We seem to have done well historically against Cumberland," said skipper James Ralph. "Hopefully that can continue and we make a good start to the season." Cumberland, who are at full strength, are captained by Gary Pratt. 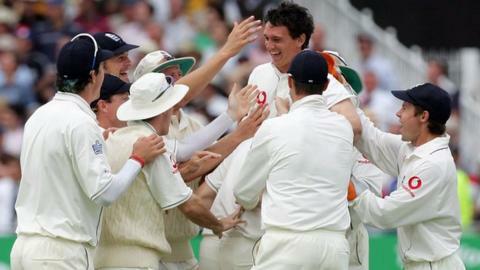 The former Durham all-rounder is best remembered for running out an aggrieved Australia captain Ricky Ponting as an England substitute fielder at Trent Bridge in 2005. But, for 39-year-old Shropshire skipper Ralph, a beaten finalist in 2003, his thoughts are only about this summer, after taking over the captaincy for a second time midway through last season. "I feel we've got a side that can compete in the three-day competition and we want to use the one-day competition as a springboard to take us forward," he said. "Winning is a good habit to get into and we want to continue as the same tight unit we were towards the end of last season. "We've got good players and I just want them to enjoy it, express themselves, embrace the challenge and if that happens we will hopefully be competitive and win games." Shropshire are also hopeful that youngsters Joe Clarke and Ed Barnard, now both with Worcestershire, will be able to play some part in the county's immediate one-day plans depending on the England Under-19 pair's New Road commitments. Shropshire: James Ralph (Bridgnorth, capt), Omar Ali (C & R Hawks), Ross Aucott (Wolverhampton), Ed Barnard (Shrewsbury), Joe Clarke (Oswestry, wkt), Jack Edwards (Shifnal), Adrian Evans (Quatt), Steve Leach (Shrewsbury), Ryan Lockley (Bridgnorth), Gurman Randhawa (Ossett), Ben Sanderson (Rotherham Town). 12th man: Simon Gregory (Bridgnorth). Cumberland: Gary Pratt (Richmondshire, capt), Josh Tolley (Crompton), Karl Turner (Guisborough), Neil Longhurst (Whitley Hall), Jon Miles (Coventry), Alex Atkinson (Penrith), Toby Bulcock (Richmondshire), Christopher Hodgson (Wigton), Scott Lees (Southport & Birkdale), Richard Gleeson (Blackpool), Liam Parkinson (Grappenhall, wkt).